Calliope—A fable about a muse enslaved by a writer needing inspiration. Dream of a Thousand Cats—A story about the power of collective dreaming told from a feline perspective. A Midsummer Night’s Dream—An exploration of Shakespeare’s classic work that blends the boundaries of imagination and reality, and how that affects the creative process. Facade—A sad tale about the masks that we wear to hide our true selves from others. The last section of this book includes something that, as a writer, I found very interesting. Gaiman pulls back the curtain to give us a glimpse at the magic of his creative process. The last section is a script of “Calliope,” complete with marginalia that provides wonderful insight into the process of creative a graphic story, essentially the nuts and bolts and schema of how the piece is constructed. It is a treat for all you writers and artists out there. One of the themes explored in “Dream of a Thousand Cats” is the power of dreams to create and shape our reality. In the beginning was the word, or more appropriately put, the thought, the idea, the dream. We cannot manifest anything unless we can first see it within our mind’s eye. Dream! Dreams shape the world. Dreams create the world anew, every night. I do not know how many of us it will take. But we must dream it, and if enough of us dream it, then it will happen. Dreams shape the world. In “Facade,” there is a very moving section where Urania has a conversation with Death about the masks that we wear, and how we stubbornly cling to these old images of ourselves, even when we know they are no longer true or healthy. Urania: But it’s also my face. You see. Sometimes I have to look normal, and then I grow faces. But they dry up, and fall off, but I couldn’t throw them away. They’re part of me. So I hang on to them. I . . . I’m probably not making much sense. Death: No. You’re making sense. You people always hold onto your old identities, old faces and masks, long after they’ve served their purpose. But you’ve got to learn to throw things away eventually. I know so many people like this, who desperately hold on to some image of who they once were. But I suspect it may even run deeper than just nostalgia for the glory days. I suspect that some people don a mask or a face, and after a while, that face that they put on, becomes who they are. Our faces and masks can change us, for better or for worse. If we keep putting on the cheerful face in spite of adversity, we eventually become a positive person. Conversely, if we wear the mask of gloom in spite of the positive things around us, eventually we become that dark, sad person which was initially just our mask. Over the year, I’ve shed many faces and grown new ones. As I write this, I cannot help but wonder what my mask will be in my later years: the wise old man, the nurturing grandparent, or the curmudgeon throwing shoes at neighborhood dogs. I suppose we cannot predict the masks we will grow. The faces we develop stem from the situations we have to “face.” Anyway, time to bring myself back out of this rabbit hole. Thanks for stopping by and sharing in my musings. I hope you have a blessed day. This is a poem of contrasts and opposites, most prominently the contrast of light and dark. But there are also contrasts between sleep and awakening, past and future, and happiness and sorrow. And while there is contrast, there is also balance. Even the fact that the poem is divided into four stanzas of four lines each generates a sense of balance, harmony, and stability. So this balance of opposites is the key to this poem, in my opinion. In the final line of the poem, Poe mentions Truth—the big Truth with a capital T. This is the proverbial Holy Grail that philosophers, poets, and artists have sought after for millennia. Poe is asserting that the Truth lies somewhere in that nebulous space between the two opposites, between the darkness and the light. And the only way that one can glimpse that space where Truth hides is to embrace both the light and the dark and bring them into balance. Think of the Yin/Yang symbol. It is a balance of light and dark, of positive and negative. Both are needed in equal parts to achieve wholeness. As we move into the dark period of the yearly cycle, we must be sure we maintain a balance of light. Thanks for stopping by, and have a blessed day. I have a confession to make: I have not read any of Salman Rushdie’s books… yet. But this will be changing soon. Last night I went to see the author give a public lecture at the University or North Carolina – Asheville, and I have to say, he was one of the more inspiring writers I have had the privilege of hearing speak. He touched on a lot of current issues regarding politics, social trends, and the role of literature in these changing times. He openly criticized Donald Trump, censorship, and the proliferation of misinformation, or “truthiness,” associated with the internet and the digital age. But there were two themes in his lecture that resonated with me on a deep level: the trend among students to attempt silencing ideas that challenge their established beliefs, and the role of the novel in bringing “news” to readers. Regarding students silencing ideas, this is something about which I often think, particularly regarding the BDS movement (boycott, divestment, sanctions) directed against Israel. I have heard horrific stories about professors, speakers, artists, etc., being shouted down, threatened, and silenced on campuses for expressing their support for Israel, all under the guise of support for the oppressed Palestinians. What Rushdie asserted in his lecture is that this is essentially censorship, and it is censorship perpetrated by the group of people who should be most vehemently opposed to the censorship of ideas. Rushdie claims that it is the responsibility of artists and professors to challenge the established beliefs and to open for discussion ideas that are uncomfortable and sometimes contradictory to one’s personal beliefs. I’m paraphrasing here, but he basically said that students who claim they do not feel safe when forced to consider challenging ideas have no place in a university and should instead be in a pizza parlor, where they will be safely sheltered from having to listen to ideas that contradict their way of thinking. The other part of his lecture I found fascinating concerned the role of the novel in presenting news to the modern reader. This puzzled me at first until Rushdie elaborated. He claimed that with the demise of print newspapers, the reading public no longer has access to legitimate news sources, that digital news sources have yet to be able to fill that gap. Instead, we get opinions as opposed to reporting. I would counter that print newspapers have historically been biased also, but I could accept that news media has become more opinion-centric as of late. Then Rushdie went on to explain how literature and the novel provide a side of the news that is lacking in usual coverage, which is the human side, the internal aspect of living in an increasingly smaller world. The way we can understand what it is like to be in situations is through literature. He used the example of The Kite Runner which provides a deeper insight into life in Afghanistan than any news story showing explosions and statistics of how many were killed. His words resonated with truth. My belief in the power of art and literature was validated and boosted. I left the lecture excited to read, to write, and to discuss ideas. I also left with a newly bought copy of Rushdie’s Midnight’s Children tucked under my arm. And while the book has been temporarily placed on my sagging shelf, I suspect that I will be reading this one before the others that have been patiently waiting for me to open their covers. Before I started reading this book, I had heard the harsh criticism directed toward it. I decided not to let it stop me from reading the book and inquired of my Facebook friends if anyone had a copy I could borrow. My friend Amy came forth and said she had one which she had preordered and was still in the box. She said based upon what she heard, she could not bring herself to even open it. I told her I would let her know my thoughts and whether she should read it or not. After finishing, I say yes, read it. Here’s why. First off, everyone needs to understand that this is not To Kill a Mockingbird, nor is it as good. Let’s be realistic—it would be quite a feat for any author to write two books of that caliber. But there is still an important message here that I feel is relevant to our current society. 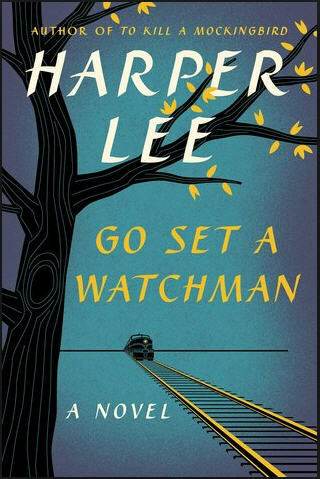 OK, yes, Atticus Finch expresses racist ideas in this book. Now ask yourself: Why does that make you so angry and uncomfortable? While racism is repugnant and offensive, Atticus is a fictional character. So this visceral reaction that people have is something more than just a reaction to racism, and this gets to the heart of why reading this book is important. The negative response to this book, in my opinion, is because a person that we have come to idolize, albeit a fictional person, has failed to live up to our idealized expectations. This need that our culture has to expect our heroes and idols to be perfect is a real problem in our society. We place political leaders, sports stars, writers, artists, and so forth, all on pedestals and we want them to be perfect. One flaw, one aspect about them that does not agree with our image of how they should be, and we attack them viciously. It is a serious problem. With the election coming up, I hear people saying “I cannot support ________ because of his/her stance on _________.” It’s not a question of how good the candidate is, or whether that person would be the better leader; it is a question of whether that person meets ALL our expectations. If not, then they are not worthy in our eyes. Now it seems we have projected our expectations of perfection onto fictional characters as well. For me, there is something really wrong with this picture. The irony here is that having our idols fall from grace is actually what this book is about. In the story, Jean Louise (Scout) sees her father fall from the proverbial pedestal. For many of us, our parents are our first idols, those we look up to for guidance and wisdom. It is often devastating when we are forced to confront the fact that our parents, like all our idols, have their flaws. The one human being she had ever fully and wholeheartedly trusted had failed her; the only man she had ever known to whom she could point and say with expert knowledge. “He is a gentleman, in his heart he is a gentleman,” had betrayed her, publicly, grossly, and shamelessly. Dealing with the disillusion that accompanies the realization that your idols (particularly parental ones) are not what you envision can have profound consequences, as evidenced by the plethora of patients seeking counseling for family issues. This is why it’s important to read this book, and face the fact that no one that we idolize can possibly meet our expectations. The expectations we set for other people by nature are not attainable. I will close with another quote from this book which I thought was great. Prejudice, a dirty word, and faith, a clean one, have something in common: they both begin where reason ends. Poor Muse, alas, what ails thee, then, today? Madness and Horror, cold and taciturn. Poured on thee love and terror from their urn? Deep plunged thee in some fabulous Minturne? With mighty Pan, lord of the ripening grain. In this sonnet, Baudelaire offers praise to his muse: alcohol. The main metaphors are all references to different types of alcoholic drinks. 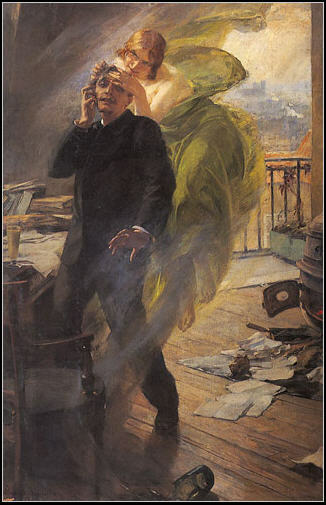 Lemure is spirit, so the “green lemure” is a reference to absinthe. Likewise, the “goblin red” is red wine. These drinks inspire both love and terror in the poet. I had to do a little searching online to find the meaning for “Minturne.” I discovered that this is the name of a swamp. So the implication here is that although alcohol provides inspiration, there is also the real possibility that it will trap the poet in a mire of darkness and nightmare. In the third stanza, the mention of perfumes is a reference to the vapors given off from the various drinks, and “Christian blood” is another symbol for wine. In the final stanza, Baudelaire evokes the old pagan gods. Apollo and Pan are both gods associated with music (hence poetry). I get the sense that Baudelaire is also using alcohol as an offering, a libation, to the old gods of artistic expression. While I cannot deny the inspirational power of alcohol, I have also witnessed its destructive power. Too many of our great artistic souls have departed us too early due to alcohol abuse. But I suppose that is a sacrifice that some must make to advance artistic expression.